PET-CT imaging allows examination of tumor staging and therapeutic response at cellular level. The method makes it possible to detect changes that cannot be observed by any other means. An example of this is metastases in normal-sized lymph nodes. In cancer treatment, the development trend is a more precise diagnosis, which strongly affects the success of the treatments themselves. For this reason, Docrates Cancer Center takes advantage of PET-CT equipment in the treatment of an increasing number of patients: in order to effectively treat cancer, the exact location of the cancer must be known. How does a PET-CT scan work? PET-CT imaging is based on a venously administered radioactive tracer that is taken up by targets that have more active metabolism – for example, cancer cells. 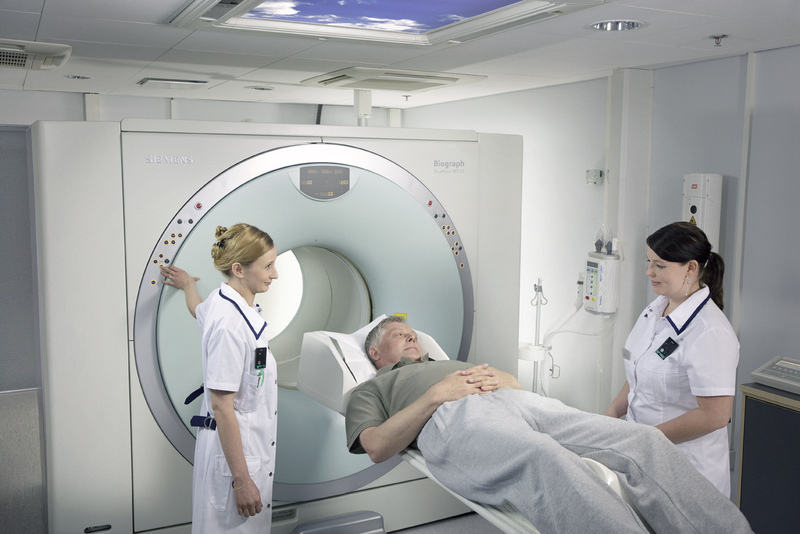 The examination always starts with low-dose computed tomography (CT), which is followed by a PET imaging stage. The images are fused, i.e. the computer combines the CT and PET images. In the case of specific cancers, the imaging may be performed not only in the ordinary fashion, but also paced with breathing, in which case as precise an image as possible is obtained of the object by computing the inaccuracy caused by breathing away from the images. At our Cancer Center, a number of different tracers are utilised in the PET-CT examinations, each of which has its own specific purpose of use. Read more about the different tracers here. We use Siemens Biograph TM TruePoint PET-CT, which opens up a new dimension for cancer diagnostics, follow-up and planning of radiotherapy.